TSPSC has conducted Telangana Teachers Recruitment Test TRT 2017 from February 24 to March 4th as per schedule anounced earlier. Candidates are awaiting for TRT 2017 Official initial key from Telangana State Public Service Commission. TSPSC has given press statement that Preliminary answer key will be placed in the official website on 14.03.2018. TSPSC also clearly mentioned in the press note that candidates have to Submit their objections in English only in the text box. Other than English languages will not be accepted. However if candidates want to upload their objections in other than English i.e Telugu Hindi Urdu and other, they have to put on paper, Scan the paper and attach the file at Submission link. TSPSC has conducted written examinations for the above notifications from 24/02/2018 to 04/03/2018. The Preliminary Keys of these exams will be available on TSPSC website from 14/03/2018. 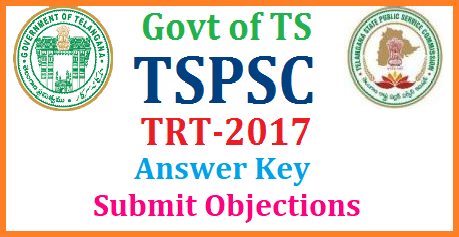 The objections on the Preliminary Keys will be accepted online on TSPSC website from 21/03/2018 to 31/03/2018. Candidates are advised to note the above dates and submit their objections through the link provided. Objections received beyond 31/03/2018 will not be considered at any cost. The candidates are instructed to submit their objections only in English language through the “Text Box of Submit Objection” link if they want to submit their objections in the form of Text. The objections if typed in other than English language in the Text Box they will not be visible and hence will not be considered. Thus those who want to submit their objection in other language should upload their objection file only through the link “Attach File” in the form of PDF duly mentioning the HT no., Paper code, series, Question no/ Question ID in the PDF file. For further details please visit www.tspsc.gov.in.